WE SPECIALIZE IN RESTORING FAMILY HEIRLOOMS, GRANDMA'S AND GRANDPA'S OLD RADIO, MOM AND DAD'S SPECIAL SET, AND THE RADIOS YOU ENJOYED AS A CHILD! 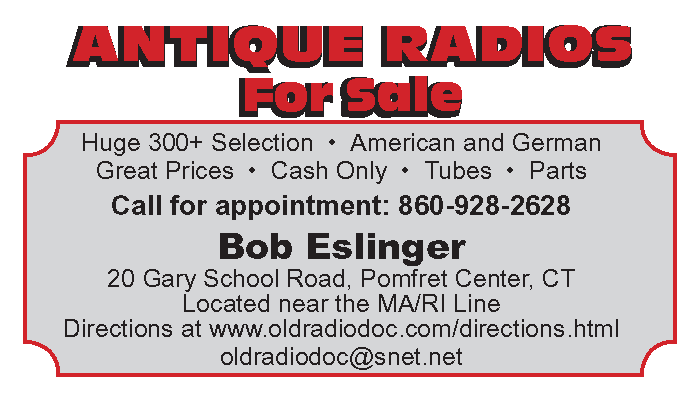 Even though I am now retired, I may still be able to assist those looking to acquire a nice antique radio, radio tubes, schematics, knobs, radio chassis' and parts. I am now downsizing my personal antique radio collection and have over 300 radios available. These would be for pickup in Connecticut only. 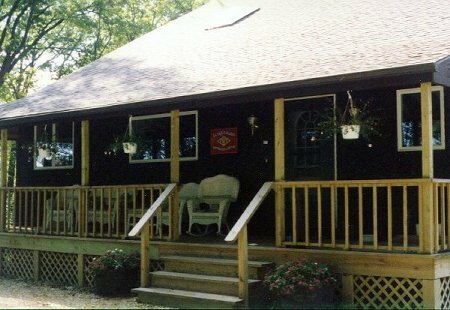 ****Visitors are welcome but visits must be prearranged. ***** chances are very good to excellent you will find exactly what you need. ANTIQUE RADIO RESTORATION & REPAIR http://www.oldradiodoc.com is for sale! America's premier shop for a quarter century. Ranked #1 on Google and just about every other search engine in cyberdom. This is a year round very busy niche business with an excellent world wide reputation. On-line since April 1994 (the very early days). Enough work to support 3 full time technicians all year long. The volume of work can be adjusted to suit your desire. 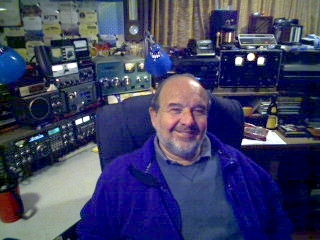 Owner Bob Eslinger/KR1U has just retired and wishes to pass the business on to a younger generation. ***Training is available***. The business is available all- inclusive with domains, reputation, inventory and my private antique radio collection ...or as a partial package if you just require the inventory for your existing business, or, if you have the inventory and just want the domains, or if you are just buying antique radio collections, etc. The inventory includes two internet domains, a HUGE parts department including inventory from 27 closed radio shops and nearly 50 years of collecting. Almost nothing else to buy for years....it's all here. Many thousands of tubes, radio chassis' for parts, escutcheons, speakers, dial glass, new capacitors, resistors, transformers, speaker grille cloth, every antique radio part imaginable, test equipment, Gernsback, Riders, Sams, Supreme-Beitman schematics and factory documentation from all the major players, etc. etc. In the event the shop is not sold, I may consider again restoring radios but only on a part time basis and only for those local enough to visit the shop (no shipping). ..and only after I take a few years rest. PLEASE DO NOT CALL. If you are unsure what the model number is, include pictures. I will do my best to put you in touch with a shop that has experience restoring radios and/or phonographs like yours. Old-time Radio in old-time Connecticut. Antique Radio Restoration & Repair is a nationwide restoration facility serving the antique radio collector and the general public. Our "soup-to-nuts" approach pleases the most discriminating collector - all new parts are hidden while old parts are kept in place above the chassis. We professionally restore and completely overhaul the radio chassis and refinish cabinets to suit the individual. Let Us FIND & Restore That Special Set For You!